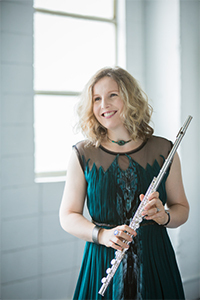 Lorna McGhee, Pittsburgh Symphony Orchestra (PSO) principal flute, will join the Carnegie Mellon University School of Music faculty this fall as an artist lecturer. Scottish-born McGhee (pictures) was formerly co-principal flute with the BBC Symphony in London. She has performed as guest principal with some of the world’s most renowned orchestras such as Chicago Symphony, London Symphony, and Academy of St Martin in the Fields. McGhee’s worked for accomplished conductors including Haitink, Gergiev, Rattle, Solti, Harnoncourt, Muti, and Honeck. As a soloist, She has performed concertos with the London Symphony, BBC Scottish Symphony Orchestra, and Scottish Chamber Orchestra. A career highlight was a performance of Penderecki's flute concerto with the Oregon Bach Festival Orchestra under the baton of the composer in 2004. McGhee has made chamber music recordings for EMI, Decca ASV, Naxos, Meridian, and Skylark. Her recording for Naxos of Bax’ Chamber Music with the group “mobius” was selected as an Editor’s Choice in Gramophone Magazine. McGhee’s first flute and piano recital disc, “ The Hour of Dreaming” with pianist Piers Lane, was released on the Beep label in 2014. As a member of Trio Verlaine, with whom she recently appeared at the Edinburgh International Festival, she has recorded “Fin de Siècle,” the music by Debussy and Ravel, and “Six Departures,” featuring works by Bax and Jolivet as well as new commissions by Schafer and Cotton. McGhee’s principal teachers were William Bennett (Royal Academy of Music) and David Nicholson (Junior Department of the Royal Scottish Academy of Music and Drama). She was formerly a visiting associate flute professor at the University of Michigan, an adjunct flute instructor at the University of British Columbia, and a visiting fellow in flute at the Royal Conservatoire of Scotland (formerly the RSAMD). McGhee was named an honorary “Fellow of the Royal Academy of Music” in 2010.